Solingen is situated at an altitude of 221 m on the northern edge of the region called Bergisches Land, about 10 km southwest of Wuppertal and 20 km southeast of North Rhine-Westphalia's capital, Düsseldorf. The municipality of the city of Solingen has a population of about 156,000 (2015). Solonchon was first mentioned in a chronicle in 1067. Early variations of the name included Solengen, Solungen and Soleggen, although the modern name seems to have been in use since the late 14th and early 15th centuries. Blacksmith smelters, dating back to over 2000 years, have been found around the town adding to Solingen's fame as a Northern Europe blacksmith centre. Swords from Solingen have turned up in places such as the Anglo-Saxon kingdoms in the British Isles. Northern Europe prized the quality of Solingen's manufactured weaponry, and they were traded across the European continent. Solingen today remains the 'knife centre' of Germany. In 1929, the formerly independent towns of Ohligs, Wald, Gräfrath and Höhscheid were incorporated into the municipality of Solingen, the municipality of Burg was incorporated into Solingen in 1975. The Müngsten Bridge [left, no. 3561: top picture] is the highest railway bridge in Germany. The bridge is 107 metres high and spans the valley of the river Wupper, connecting the cities of Remscheid and Solingen. First drafts for a bridge connecting the two cities of Remscheid and Solingen go back as far as 1889. Preparatory work began in 1893, the bridge was finished in 1897. Architect and engineer Anton von Rieppel was in charge of the project. Originally, the bridge was planned to be single-track. However, high future traffic growth projections led to the redesign as a dual-track bridge. Before its opening, the rail distance between the cities was 42 kilometers. With a direct connection via the bridge, this distance shrank to 8 kilometers. Originally the bridge was named Kaiser-Wilhelm-Brücke (Emperor Wilhelm Bridge) to honour Emperor Wilhelm I (see list of monuments for Wilhelm I). After the end of the monarchy the bridge was renamed after the nearby settlement of Müngsten, which was close to the city limits of Solingen, Remscheid and Wuppertal. Today, the settlement no longer exists, so Müngsten is simply a landmark. The Laufbrunnen (fountain) with the sculpture "Waffenschmied von Solingen" ('armourer of Solingen') [bottom left picture] was created in 1895. The sculptor was Wilhelm Albermann. The fountain and sculpture were destroyed in 1944. The Catholic parish church of St. Clemens [bottom right] was built in 1890–1892 in Gothic revival style by the architect Franz Schmitz. Heavily damaged during World War II, it was restored in 1951–1955. The interior decorations were renovated in 2006. Schloss Burg (Burg castle) was built in the 12th century (after 1133) by Count Adolf III of Berg on a mountain over the river Wupper. The old castle of the counts, Castle Berge near Altenberg, was abandoned. The original name of the new castle was Castle Neuenberge; Not until the 15th century, after significant reconstruction as a hunting castle, did it receive its current name reflecting its palatial extension. Adolf III's great-grandson, Count Adolf VI, died in 1218 in the siege of Damietta in Egypt during the Fifth Crusade. As the count had no male descendants, the archbishop Engelbert I of Cologne took over the reign of the county (Engelbert II of Berg) needing two feuds to win the inheritance dispute with the duke of Limburg. Count Adolf VIII of Berg participated successfully in the decisive battle of Worringen (5 June 1288) of the War of succession for the Duchy of Limburg. Adolf VIII now was able to proceed to elevate his town, Düsseldorf, to a city and was able to control traffic on the Rhine river. In the 13th and 14th century Schloss Burg remained the main residence of the counts of Berg. Five years after King Wenzel IV of Bohemia (German king since 1376) elevated Count Wilhelm II of Berg to the position of a duke (Duke Wilhelm I of Berg) in 1380, Düsseldorf became the capital of the Duchy of Berg. Castle Burg continued to serve as a hunting castle and was used for ceremonial events, hence it became a “Schloss” (representative castle). In 1496, Maria of Jülich-Berg was engaged as a child to Johann of Kleve-Mark (later Johann III, Duke of Kleve). Their wedding took place 14 years later at Burg and led to the unification of the duchies of Jülich-Kleve-Berg. The second daughter of this couple was Anne of Kleve, briefly married with Henry VIII of England. In 1632 Swedish soldiers laid siege to the castle. After the Thirty years war, in 1648, Imperial troops destroyed the fortifications of the castle including the keep, walls, and gates. In 1700, the main building was partially reconstructed and subsequently used for administrative purposes. 1849, the castle was sold to be scrapped, decayed, and became a ruin. 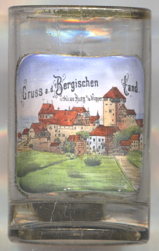 The architect Gerhard August Fischer from Barmen (today part of Wuppertal) proposed in 1882 to reconstruct the castle. Restoration works began in 1890 and with the erection of the Battery Tower in 1914 the work seemed complete. However, on the night of November 26, 1920 a large fire destroyed much of the castle. Reconstruction lasted from 1922 to 1925. The reconstructed castle of today is a major public attraction. It also contains the Museum of the Bergische Land. The castle church is popular for weddings. The castle also is home to the Memorial for Deportation and the Memorial of the German Eastern Provinces with church bells from Königsberg (Kaliningrad) and Breslau (Wroc&lstrok;aw). Ohligs, located in the southwest of the municipality of Solingen, is part of the district Ohligs/Aufderhöhe/Merscheid, the largest town district of Solingen in terms of population (42,000 in 2015); Ohligs itself has a population of about 20,000 (2015). Olligs was first mentioned in a document dating from 1714. After the foundation of the grand Duchy of Berg in 1806, the marie (municipality according to the French model) Merscheid was founded in 1808 from the former parish Wald, which included Ohligs. When in the 1860s a railway line was to be built from Cologne-Deutz to Haan-Gruiten, the local station could only be built at the then undeveloped fallow land of Ohligs. The station, then named Ohligs-Wald, today is Solingens main railway station (Hauptbahnhof). Due to the enormous development of industry around the railway station, the importace of Ohligs rapidly increased. In 1891, the municipality of Merscheid was renamed Ohligs. 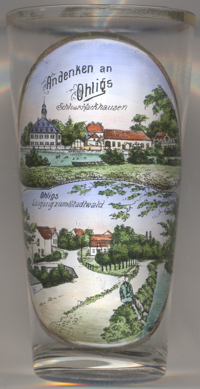 In 1929, Ohligs, together with the towns Wald, Höhscheid and Gräfrath were incorporated into Solingen. Hackhausen castle [left, no. 3441: top picture] goes back to a moated castle from the Middle Ages. The dukes of berg inherited the castle in the 15th century but due to lack of money already in 1485 sold it to the Bottlenberg-Kessel family. In 1772 the old castle was demolished to be replaced by a more representative palais in Rococo style keeping the old moats around it. This castle was completely destroyed by fire in 1887. In the 1890s, the ruins were sold to private owners who in 1907 had it rebuilt according to the original design. The bottom picture on glass no. 3441 is labeled Eingang zum Stadtwald (Entrance to the municipal forest).